OMG! 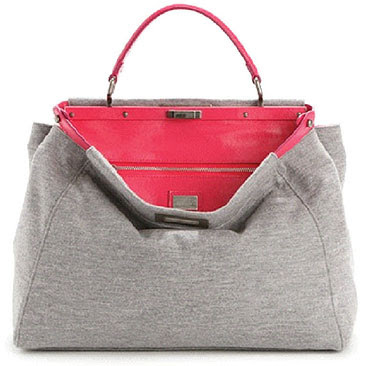 I am crazy about this Limited Edition FENDI Grey Jersey Peekaboo Satchel w/ Hot Pink Leather Lining!! It's so uptown chic yet downtown cool! Combining the everyday material as the jersey fabric that we wear as the sweatshirt with luxurious hot pink color leather, it's a must have for every hip fashionistas! 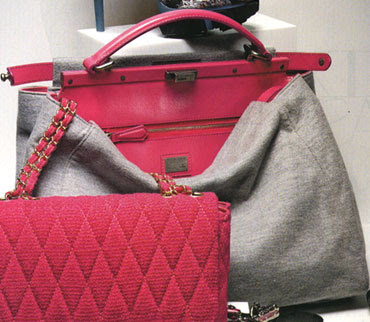 The Fendi Peek-a-Boo bag is an "underground" celebrity it bag. 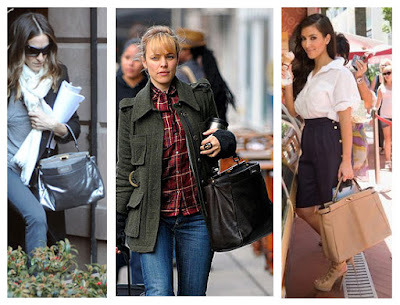 It's a pretty low-key handbag, , but it just screams luxury. We've been reporting many different style of the Fendi Peekaboo Satchel in our blog, but this new jersey peekaboo is one of my favorite one, because it has a very similar shape to the Hermes Kelly bag, but this Fendi Peekaboo satchel has a classic shape without seeming "snoby" and bourgeois like the Hermes Kelly.... and it's way more hip and easy to carry. 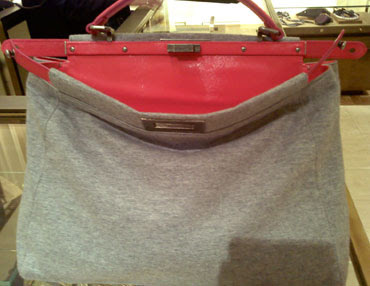 Don't get me wrong i love Hermes, but compare to Fendi's peekaboo, I like this bag more, it's just my opinion. • Light grey jersey fabric with hot pink leather lining. • Adjustable, removable shoulder strap; 25" drop. • Two interior pockets; one zip, one open.• Includes dust bag. Here is FENDI spring-summer 2010 fashion show, enjoy! If you love this bag as much we do, the bag is available is Avaliable at Luxe-Gifts.comThe Fendi boutique told us there were only 3 in the U.S.A and we're lucky to get one directly from them! 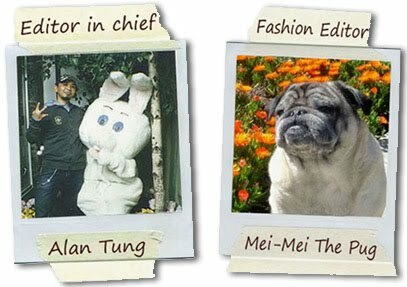 Come check out our store!